In my case problem was that for some reason temporary file was too big (somehow it reached 100 megabytes) and it timeouted – now i’m clearing this file every time before recording, also header and file should have same rate: “audio/x-flac; rate=YOUR_RATE;” otherwise google will return empty results. I noticed this is from 2011, does it still work? Is there something more up to date? What is exactly the upper limit for the file we can post . ? The key for google API can be get in the google APIs console for free. But the question is how to increase the max limit of 50 requests ‘a day? I found no way to get more, and the link to order quote is dead. The Google corp. forces me and other developers to find any other way to solve this problem. I see the solution in java script for Chrome browser. But if anybody need this API i.e. for C# then he must to switch the source of sound from microphone into the file stream in flac format. My question is now – how to change the source of sound from microphone into binary file on disk? 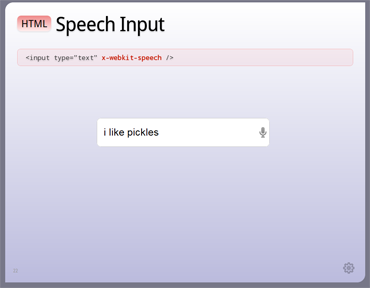 Pingback: How does Google Keep do Speech Recognition while saving the audio recording at the same time? Hey guys I am using speech api for generating subtitles for videos but as api accepts only 15 sec of audio we want to divide extracted audio into frames of 15 secs. Can anyone please help me how this can be done. Also I dont want to use any tool for dividing in frames.